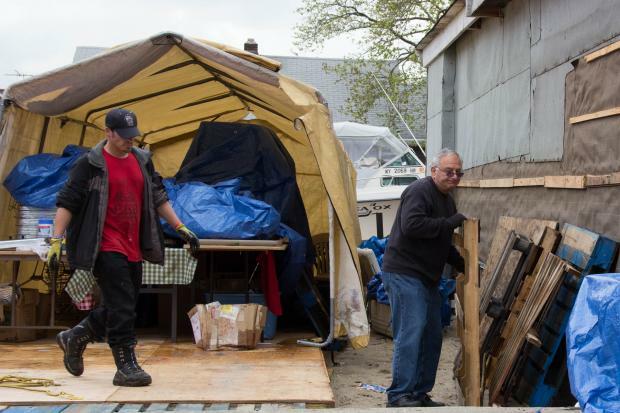 NEW DORP BEACH — A Hurricane Sandy relief center that was forced to move to clear a path to the beach had its new location shut down by the city this week. The Cedar Grove Community Hub tried to relocate its tent city across the street from its original location, on private property owned by supporter Dominick Traina. But the Department of Buildings told organizers Wednesday that the hub could not put up tents without a permit. The development was first reported by Fox 5. After the hub's volunteers moved two tents over to Traina's former home at 101 Cedar Grove Ave., the DOB issued a stop-work order on the site and gave Traina a violation. According to the DOB, to build the tent city on private property the hub would need to obtain a permit. “In order to ensure safe construction, a permit is needed to erect this type of structure,” said Gloria Chin, a spokeswoman for the DOB. However, Graziano said she did not think she needed the permit because she never needed one when the hub was across the street at the entrance to New Dorp Beach. Last month, the hub was given three weeks to relocate so the Parks Department could start work on shoreline protections and give residents access to the New Dorp Beach in time for Memorial Day. The original deadline for the hub’s relocation was Wednesday, but Graziano said Parks extended it until Friday so she can find a new spot. Six months after the storm, many residents said they still rely on the hub to provide them food while they rebuild their homes. Hundreds of people showed up to sign a petition supporting the hub at a community meeting last month. “I’m still depending on her to help feed my family. I know it’s six months down the road from when it happened, but life doesn’t stop for me to fix my home,” Diane Camerada, who lives in New Dorp Beach, told DNAinfo New York. On Thursday, Traina tried to talk to the DOB again to see if there was a way to keep the tents up, but he said officials told him they had to go or he would continue to get summonses. "I can't afford a summons right now," he said. Graziano said she’s working on getting a flatbed truck to host a trailer that was given to her to continue her relief efforts. But she has not yet applied for DOB permits to build her hub, so its future remains up in the air. “I don’t know what’s going to happen at this point,” she said.